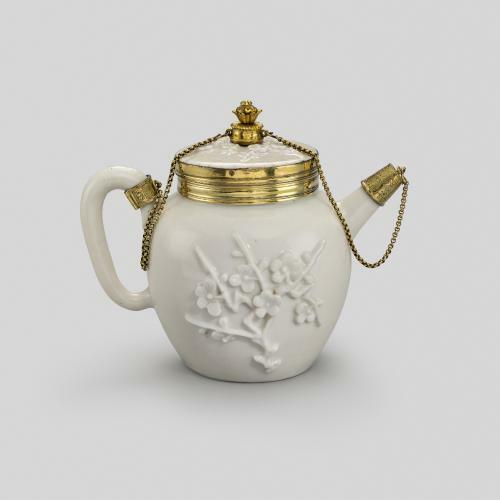 This type of Chinese ewer, known as a duomuhu, is a cylindrical vessel traditionally used to store butter, milk and wine. Its shape derives from a Tibetan form called the bey lep, which translates to ‘bucket for butter’, however it was also used for storing milk tea in Tibetan Buddhist monasteries. The duomu hu first appeared in China in the Yuan dynasty (1271-1368) when Buddhism was first adopted under Kublai Khan. Four centuries later, during the Qing Dynasty, The Kangxi Emperor (1654-1722) renewed an interest in Buddhist thought, tradition and culture. 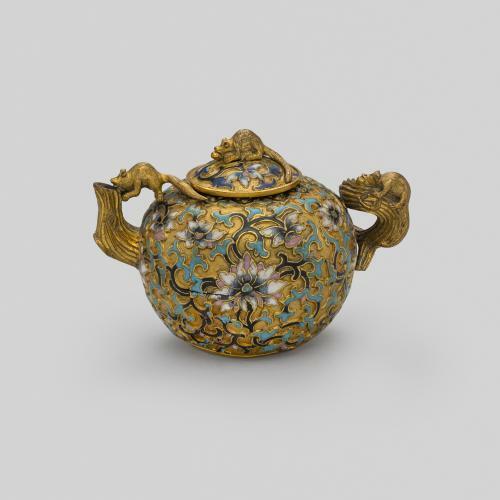 During his reign, vessels of this duomu huform were often made from richly decorated metal or porcelain and were also used for steeping tea leaves. White monochrome cloisonné examples are particularly rare and on this duomu hu, each horizontal register is adorned with the Bajixiang, the Eight Buddhist Emblems, comprising of the Wheel of Dharma, the conch shell, the victory banner, the parasol, the lotus, the treasure vase, the paired fish and the endless knot, which on this example surrounds two large Indian lotuses amidst meandering stems and leaves. 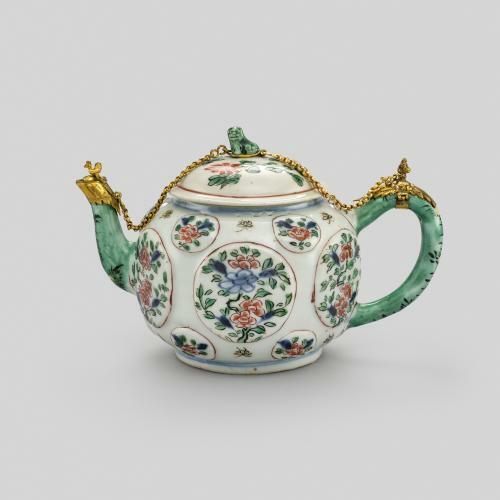 The spout and handle issue from gilt dragon heads, a symbol of Buddhist enlightenment.